Paul Martin and experts Anita Manning and Kate Bateman unearth some treasures in Milton Keynes: a dazzling art deco ring and a mourning locket. and most of you will know what I'm on about. 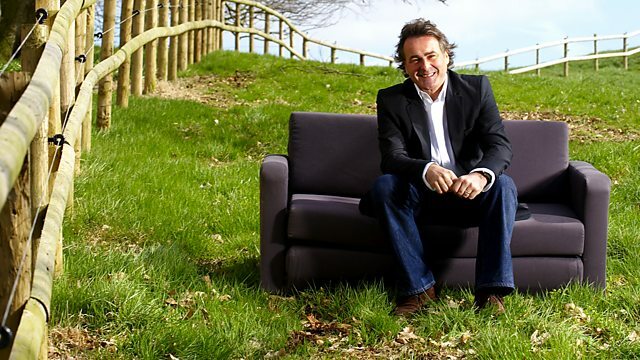 Today, Flog It is in Milton Keynes. It's hotly debated exactly how many roundabouts there are here in Milton Keynes. Some say there's a mere 300. Others say it's closer to 1,000. But whatever way you look at it, you have to look around and see there are loads of them! in 1978 from the American artist Liz Leyh. For works of art, they've had a rough time. A couple have been stolen. The Mona Lisa didn't have this sort of trouble! the Jurys Inn, in the heart of Milton Keynes. They're not here to see modern sculpture. They're here to chew the cud with our antiques experts Anita Manning and Kate Bateman. and see what they've got to say. Anita's spotted some plates. But I don't think anybody will be eating off these! David, Tina, welcome to Flog It. I'm so happy that you've brought us along these wonderful big plates. -All right. Where did you get them, David? I inherited them from a great aunt. and got the MBE for her services. in what was a living will. -You're very good, David. Are you after my job? -I like the geography of Europe. -Tina, what did you think of them when they arrived? -I thought they were beautiful. and a big enough room to put them in, then we would keep them. David, I think you're absolutely right in the geography. They're from a Swiss factory. that would have been bought by people on their Grand Tour. -They date from the late 1800s to the early 20th century. They were made over a reasonable period of time. We have these hand-painted scenes in the centre. Both different scenes and probably from Switzerland. and we have some little figures in boats. They are hand-painted. Not signed. They would have been done by artisans rather than artists. than you would get from production items of today's age. So I would like to keep the estimate conservative. with an estimate of 150 to 250. -Now, how do you feel about that? -Good. Let's go for 'em. Let's flog it. Next is our new girl, Kate, who's found a glamorous little sparkler. So, Sadie and Leah, you've brought in this lovely ring. -It was my nan's ring. I just had it in a jewellery box. My little girl, Leah, used to play in the garden with it. In the garden with it? Just to take it out and pretend it's yours? Did you ever drop it? -In the garden. We had a tub of flowers. -You are a lucky young lady. So you don't know much about it? OK. Well, it's a really nice ring. Art Deco. Sort of like a dress ring. It's got lots of diamonds! Very sparkly, as you can see, and a central oval ruby. Date-wise it's about 1920s, 1930s. -I took it down to my local jeweller's. to take it to a proper auctioneer and let them have a look. -So he wasn't interested in buying it. Two to three thousand for an insurance valuation is right. -that you'd expect to get at a sale. -And the problem is not a lot of people are going to be able to wear it. -It's not something you'd pop down to the shops with. No. Not when I found out it was... I'd assumed it was a dress ring. I didn't assume it was real diamonds. It didn't look like that when we first had it. He cleaned it all up for me. -OK. So quite surprising to see it shining. you'd probably expect maybe an estimate of 1,200 to £1,500, something like that. A reserve somewhere just below that, so £900 as a reserve. -Is that the sort of figure you'd sell it for? because it's just sitting in a box. What would you do with the money? This is your inheritance, if they sell it. -Don't want to inherit it? Rather get the money? -If you're happy, we'll try and get you a new car. We'll flog it. but wasn't fortunate enough to have a Ringo Starr drum! -How old were you when you got this? -Mid-'60s. This is definitely '64, '66, somewhere around there. Did it inspire you to take up drumming? Afraid not. I was never a Beatles fan. and the Rolling Stones were the rock'n'roll bad guys, got into trouble. The only use it really had was me trying to wear out Ringo's face! I'm pleased you didn't cos this is the original skin. -These skins are very good, almost like professional skins. which Ringo would have used. This is made by Selco in this country. with ten tuning lugs. His drum kit was a Ludwig, an American drum. -is a set of snares. -Wires soldered together on a strap. There's about 24 of them that run the length of the drum. They're held on with string which goes into those two holes. and makes it sound as if it's a marching drum. I wish we had some drum sticks! Tell you what, we've got some spoons. -and I think this is a good starting-off instrument. -It's a bit more than a toy. It's more than a toy. Now, we've sold Beatles guitars on the show. I think one achieved around three or four hundred pounds. -Have you any idea what this is worth? -I was hoping 150 to 200, along those lines. I could say I think you're bang on! -Cos not many have survived. If we put this into auction, we'd put it in with a value of 200 to £400. A fixed reserve at 200. Irene, you've brought in this truncheon. What can you tell me about it? Just that my mother owned it. It used to be her uncle's, many years ago. She just kept it and one day said, "It's something you can have." -And I thought, "Ooh! Nice!" When you were younger, you never asked questions what it was about. -OK. And was that fairly locally? -Round Wolverton, which is in Milton Keynes. It's a late 19th-century policeman's truncheon. Have a look here. It's quite nicely decorated. All these hand-painted things on the front. and a VR for Victoria Regis cipher. but it would have had a leather strap for the wrist strap. as well as a highly effective thing if you're gonna hit someone! OK, so it's quite hard to display. Sometimes they have wording on them like where it comes from. So you'd have the county or something. This just says constable. But you've got the VR cipher, so it's Victorian, pre-1910. -Price-wise for auction, do you have any idea what it would go for? I would think probably for an auction estimate, you'd put 80 to £120 on it. -So you want it to sell. -And an estimate of 80 to 120. -We'll see you at the sale. on their way to the auction. David's hand-painted plates originally came from Switzerland. They've got to sell today - they're too heavy to carry home! is much better off in a sale room than in the garden! about the value of the Ringo Starr drum. is so beautiful, the bidders are bound to find it arresting! and today's venue is the Old Town Hall. For years, this has been owned by Flog It favourite Charlie Ross. but he's using Charlie's talents today on the rostrum. Let's go inside. about the Ringo Starr drum. I fell in love with this at the valuation. It belongs to Cliff. It's a Newbeat snare drum. It's a cracking bit of Beatles memorabilia. You're thinking I've gone mad! I think this will sell for around £200, possibly more. little aubergine and orange guitars, 1960s guitars, on the show before. If I recall, one went in Cardiff. I think we put something like £90 on this little guitar. 60 to £90. And it fetched 200 to 300, around there. So I'm basing my knowledge on what's gone before on the show. I haven't seen another one, Paul. It's more your area than mine. I don't blame you! All I could do is go by what we've sold before. We've seen plenty of these on the show, a Victorian police truncheon. They make cracking money if dated and in great condition. This one's condition is superb. We've got 80 to £120 on it. It belongs to Irene here, possibly for not much longer. It was my mother's uncle's. I wonder if someone was in the police force in the family? -Let's hope you're right, Kate. The condition, as you say, is great. So it should sell pretty well. You're right, if it had been dated, or a warrant number on it. -Or name of a place. You could attribute it to a local police station. -Wow, you're looking at 400 to £500. Lot 577 is a Victorian constable's truncheon. In fantastic condition. £50, I'm bid. Five. Five. Your bid. 85 on my left. 90. Five. 120. Your bid in the back, standing. 40. 150? 140 in the back, then. -What are you going to put the money towards? -Well, we're going to Norfolk. -We take the pets with us! -A border collie and a dog. -A collie and a cat. "Border collie and a dog"! You know those moments when I say credit to our experts, they were spot on? Well, it could go horribly wrong now for us. We've got Cliff and the Ringo Starr snare drum. A lovely bit of retro 1960s plastic. But unfortunately, the auctioneer didn't agree with my valuation. and he's too young to understand The Beatles. I'm just hoping the room's full of Beatles fans. Spot any? There's a lot of bald heads! The circle Newbeat snare drum. A Beatles promotional drum. There it is. And I'm bid £110. 120, anywhere? At 110. 160. It's not your bid. Any more bids? All done? Can't be done, I'm afraid, ladies and gentlemen. We move on. We got it to 150 in the room. Put it in a specialist music sale. There were no other instruments here. -Just a few old violins. -Thank you. I'm really sorry it didn't sell. Next up, two beautiful hand-painted plates. They're quite large, from the 1800s, and belong to Tina and David. Great to see you. You look absolutely fabulous! -Originally, Anita, we had a valuation of 150 to £200. We decided that at the valuation day. Since then, David's done some research. He's put the reserve up. It's not 150 any more, it's now 250. These plates may well do 250 or more. A low estimate doesn't jeopardise the price. -It's more of a "come and buy me". Where did you do your research? How did you come by the price? Some of these plates, a lot smaller, are selling for 1,500 US dollars. -They're for sale at 1,500 dollars. You have to be really very careful. You think you can do the research on the internet, but it is limited for the private person. It's going under the hammer. Good luck! on a lake with mountains beyond. Within a broad band of floral panels. The reverse each signed "Toon". -It's on my right, now. Selling at 260. 260. Just over reserve. Well done. Sadie and Leah, we've been waiting for this for a long time. Is it exciting? Not only a day off school, but a day in an auction room. -Have you been in one before? You can't see a lot at your height, but it's all going on at that end. Charlie Ross is on the rostrum, selling all our lots. Hopefully, this little ruby ring - we've got a value of 1,200. -Just over £1,000 is coming hopefully your way. in an Art Deco mount. At 800. I'll take 20 if it helps you. Bid's at 800. And 20 now? Say now. You're all out seated at 800. And 20 is it, now? At £800. Any more bid? No more? At 800 it is. Can't be sold, ladies and gentlemen, at £800. We had a fixed reserve of 900 and I'm pleased you protected it with that. -You don't want to give it away. -No. I don't think the jewellery dealers were here. It's a stand-alone piece in the room. There's no other diamonds or gems here. -OK, we'll take it home, Leah. -It's got to go home! -That's OK. Thank you, anyway. Sadie accepted a private offer of £750. So she'll be able to buy that much-needed car after all. These are just some of his classic and much-loved children's stories. And this big blue building here couldn't be anything else but the Roald Dahl Museum and Story Centre. which is also based here. That's her office by the sign on the first floor. She can remember him reading her bedtime stories. Sounds absolutely fascinating, so let's have a chat with her. Let's hear Amanda tell us her story about Roald Dahl. and where he wrote all his children's books. As a child, our families were friends. I was in the same class as his second child, Tessa. Roald did the morning lift to school, my mother did the evening. so our lives were pretty interlinked. Was he good fun to be with? Yes, he was very imposing. so he seemed a giant when you were a child and I think he hoped he was the Big Friendly Giant. Do you have any fond memories of him? He always wanted to take that bit of childhood fun a bit further. but generally they don't happen. But he would get us up in our pyjamas and say, "We're going for a walk." and he would tell a story under there. the stars, witches, foxes, anything. So that was just completely magical and different. Dahl's children's books would turn out to be. and boy, did the kids like to meet him! You're not frightened of me, are you? They're all sort of funny and nice. Better than the other people's books. Charlie and the Chocolate Factory is Penguin Books' best-selling book of all time. so can you sum up why he was such a successful writer? to become part of the popular culture. There's nothing old-fashioned about Roald Dahl. He's contemporary. but it still feels very contemporary. They're nearly all moral tales, in one way or another. Um, and the child is generally the hero. At least the good children win and the bad children get their come-uppance. Talking of Charlie again, what happens to the horrible children? They all end up going down the chute. The Oompa-Loompas get rid of them. But we know Charlie is a good boy. -or good people get rewarded. So out of the dark comes good. the combination of the two talents worked. -Children can identify with that. -Here is a crocodile that eats children. But he has huge teeth. But somehow, they're funny. There's something amazing about the combination. here's a great thing when the prince chops off Cinderella's sister's head. "What's all the racket? ", Cindy cried. "Mind your own biz", the prince replied. -This is a great example, isn't it? -Yes, her face. It's not ghoulish, it's just funny. but they won't be killed in a conventional way. or chopped up or anything like that. It's just straight. Bones crunched up and everything. and coming out as fudge. That's fine, as long as there is a whopping great laugh at the same time. He always said it's got to be fun. The books have to be funny. And that came to him naturally. where he describes the granny as having a mouth like a dog's bottom. you only have to say it and you laugh, but no-one else would write it. But he did. What would he have made of the museum downstairs? One has to remember he would have been 92 had he been alive now. He said those things when museums were quite stuffy places. at a time when museums can be really good fun. and it's a great fun place. and Amanda was right. The children were having a scrumdiddlyumptious time. who'd have been very at home in the museum. 'Most adults have forgotten how children are thinking. Back at the valuations, Anita has found some playful Clarice Cliff. Clare, Clarice Cliff was one of the leading ceramicists of the 20th century. People either love or hate her work. -These, I think, are hideous, really. That's a word that my father described them as, "hideous". Indeed. Tell me, where did you get them from? They were given to my grandparents as a wedding gift. I think that was in 1936. Then my mum's always had them on the shelf in the kitchen. That's where I remember seeing them. and said, "Get rid of them. See what you can do with them." we see the magic name, Clarice Cliff. and some of them are more collectible than others. Now, these are not the top-of-the-range Clarice Cliff. They're from the series "My Garden" series. which is a band of flowers. it was very popular in its day. They were made in the 1930s. Because they were popular, they made a large amount of them. So they weren't rare, and in today's market, that brings the price down. -I would estimate them between 100 and £150. but you're not going to go to 200, £250. I would love it to happen! I think my dad would, also! -So would you be happy to sell them? and we'll hope they'll be very well fancied on the day. -Clare, shall we flog them? So, Steve, you've brought in this bizarre, rather large, animal. It's an elephant and a tiger. What do you think about it? Um, I like it. It's just gathering dust, really. but I've got nowhere to display it. And if the little 'un knocks it off, it would be quite upsetting. Ah, you've got a young child that might break it into pieces. -Does your wife like it? She'll be sad to see it go, but if it gets broken, she'll be even more gutted. Do you know anything about it? The maker, or...? It's got on the bottom it's a Beswick. I've nothing else to go on. I know it's from my gran's cos I've seen it since I was young. Yes, Beswick is the mark, an English maker. It's fairly modern, 20th century. But they make quite a lot of these animal models - cows, sheep and things. They also do a series of wild animals, of which this is one. They do this model in various sizes, a small, medium and large, and this is the large. You've got a big bull elephant being attacked by a tiger. So quite a violent theme to go on your mantelpiece! You can see the detail in the hide of the elephant, the face on the tiger. Also, Beswick bits always get broken off. "or the tusks always come off. "You get chips on the legs or the ears." considering it's been kept in the loft! -It didn't cost you anything. -Any idea as to value? I've got no idea. As far as I'm concerned, it's more sentimental. There are lots of Beswick collectors out there. But it means nothing to them in terms of sentiment. It's, "Is it one of a number that were produced and how rare is it?" But the condition's great. For an auction value, you'd put 150 to £250 on it. -So for that kind of price, you'd be happy to sell it? The estimate for the catalogue is 150 to 250. I would suggest a lower reserve of £100. But you can make that discretionary so the auctioneer has a chance to sell it. -So see you at the auction. Jill, welcome to Flog It. And it's lovely to have that gorgeous piece of Victorian jewellery here. My grandmother gave it to me when I got engaged in 1974. -Did it belong to your grandmother? I think so, but I don't know anything about it. -No pictures of her wearing it? Why haven't you worn it? Is it not to your taste? and it's big and dark-coloured. Although I knew it was beautifully made. -So it's a bit sort of sombre. OK, let's just have a closer look at it. The case is not marked for gold. then they would not have hallmarked it. all these things indicate to me that it is gold. has this beautiful banded agate oval on it. So it's a lovely thing. and have a little look inside. -He's quite a sombre looking chap. -Could he have been a boyfriend or a fiance? which is typical of mourning jewellery. When Prince Albert died, Queen Victoria went into mourning. from about the 1860s, 1870s. I would put an estimate of 120 to 180 on this locket. -Would you be happy with that estimate? -Shall we sell it at that? -I'm hoping it will go much higher. Time to have a final look at what is on the way to the sale room. Luckily, not everyone shares Clare's low opinion of Clarice Cliff! I'm sure these jugs will soothe a new owner. The Beswick collectors will love the condition of Steve's elephant and tiger. It's going to be a jungle out there! but it's quality - and you know what I always say about quality. First up, those Clarice Cliff jugs. Clare, good to see you again. You've brought the kids here? I've got Joshua. He's four. And Rachel, who's 16 months. I like Clarice Cliff. I think it's very cheering. -It's lovely in a kitchen. Hopefully, we'll get around 100 to £150. No? What does Rachel think, I wonder? Hey, Rachel? Oh, she's bidding. You just bought something! with moulded floral loop handle. Bid 65 to clear commission. 70 I'll take. At 65 for the pair. 75. 80. At 90. And five. 100. 100 elsewhere? Bid's at 95. May I say 100, sir? 95 is the bid, then. At 95. All finished at 95? 100 now? I'm afraid, ladies and gentlemen, we are one bid away. Not sold. I just don't believe that. One bid. one bid away. So close! -But Mum and Dad set the reserve. We've seen plenty of Beswick on the show before, but nothing like this. A tiger on the back of an elephant. It belongs to Steve, not for much longer. It's in good company. Have you seen the amount of Beswick in the room? -I'd say there's about 300 lots there. So the collectors are gonna be here. I think they'll snap yours up. -Do you think it'll get top end? -It'd be nice if it did. It's unusual, not the normal thing people go for. But I think so, yeah. I had a chat with the new owner of the sale room, Jasper. but it will do mid-estimate. So we're pretty safe. Lot 65 is a Beswick elephant and tiger. Large group. 50 bid. Five. 60. Five. No? At 70. Five now. 75 in two places. 80. 80. 90, may I say? 90. Make no mistake, I'm selling at 90 in the front row. Anybody make it 100? And 100 I'm bid. And ten, sir? Pipped at the post. 110. 120? No? 110 your bid. Front row. All done at £110. Yes. Nice work, Charlie Ross. and breaking in a few weeks' time. Take the girlfriend out for a meal, I suppose. -She'll hold you to that! It's on camera! Let's hope this isn't a sad moment. It's a Victorian mourning locket. It's Jill's and has been in the family a while. because you want to put the money towards a new addition. We've just had our first grandchild, called Isobel. It's easier to sell it, because this was a special present to you. When we got engaged, my grandmother gave me this, 33 years ago. A long time. It's hard to sell things people give you as presents. But in this case, selling it because of a new addition to the family, I think is wonderful. It's such a lovely thing and it's in perfect condition. You haven't worn it. It's been in a drawer. I think if you don't like it, it's the time to sell it. I think it might be to today's tastes. It's a big chunky piece. Does that mean we'll get the top end of the estimate? I don't know, Paul. We'll have to wait and see. What are you looking for secretly? 150 would be very nice. But the market will determine. circa 1880. Late Victorian pendant. I can start that at 85. 90. Five. Are you taking instructions? 380. 380. You're out on the stairs. 380 in the middle of the room. And I was right. I thought that it might be to today's tastes. -And also a "Come and buy me..."
-"Come and buy me" valuation! -I can be a bit like that. -You've got to be pleased with that! Wow! I'm feeling hot over that one! -That's gonna be put towards the christening funds. Fantastic. Thanks for coming in. -Well done. That was marvellous! Well done, Anita. What a "come and buy me" that was! That's it. What a great day we've had here. and all credit to Charlie Ross. He's been magnificent as have our two experts today. We've had a great time at Woburn. Until next time, cheerio! Paul Martin and experts Anita Manning and Kate Bateman are in Milton Keynes. During the day they unearth some real treasures - a dazzling art deco ring and a mourning locket which get the bidders buzzing in the sale room later. Paul also drops in on a local museum celebrating the life and work of famous writer Roald Dahl and talks to a group of very excited youngsters.